Microsoft: At a Threshold, or a precipice? These are interesting times, indeed. As much as the landscape of computing and the internet have changed over the past ten years since the arrival of Google, the iPhone, and the iPad, all indications are that we ain’t seen nuthin’ yet. 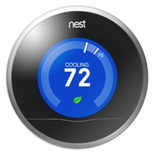 Yesterday, Google announced its intention to acquire Nest Labs, makers of the internet connected Nest Thermostat and Nest Protect, a smoke and carbon monoxide alarm. While there have been plenty of jokes about Google wanting to intrude (even more) on your privacy, working their way into your living rooms and bedrooms, we think there’s a lot more to it than that. Google has taken a bold step to move into “the internet of things”, a connected web of information gathering devices that could make not only our homes and neighborhoods more efficient, but help us drive our cars, manage our travel and our lives. In some ways, the most interesting thing about Threshold is how it recasts Windows 8 as the next Vista. It’s an acknowledgment that what came before didn’t work, and didn’t resonate with customers. And though Microsoft will always be able to claim that Windows 9 wouldn’t have been possible without the important foundational work they had done first with Windows 8—just as was the case with Windows 7 and Windows Vista—there’s no way to sugarcoat this. Windows 8 has set back Microsoft, and Windows, by years, and possibly for good. What started out, with Windows 8, as an interim step in how to get Windows onto tablets, using touch, was refined with Windows 8.1 (partly to accommodate those users still on a keyboard and mouse), and will be refined again with Windows 9, “maturing and fixing” the design language to make Windows more palatable to users and corporations unwilling to move forward. In some ways, this isn’t so much “an acknowledgment that what came before didn’t work”, but a progression, however slow, along a path. The problem is that the world is moving much faster than Microsoft is, and continues to do so. While Microsoft struggles to prove against all odds that this isn’t a “post-PC” world, other players in the space are innovating rapidly, already moving well beyond the PC. This doesn’t have to mean that it’s all doom and gloom for Microsoft, however. They’ve certainly seen the need to change, starting with the ouster of Steven Sinofsky. The recent re-organization within Microsoft, and its attempts to blur lines and get the company working together as “One Microsoft” is supposed to help streamline operations, but Microsoft still lacks true vision, the kind that can see past saving Windows or Office and move the company into a next generation of computing. Steve Ballmer saw this, and knew he wasn’t the right person for the job. It’s unclear, however, if Microsoft will find that person, or if the company will still be too encumbered by Bill Gates and Steve Ballmer on the board to take the kind of bold steps the company needs to take, the kind that Google took yesterday.